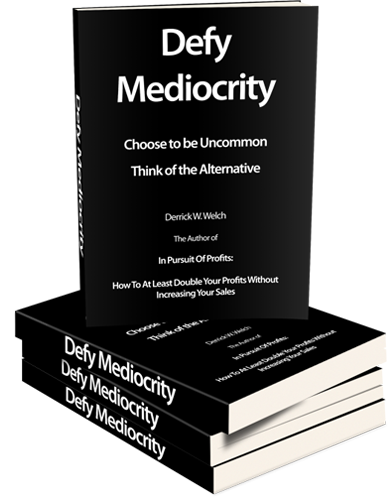 Defy Mediocrity - The resources you need to dramatically improve the bottom line of your company and the direction of your career. Imagine hearing these words the next time you report to work. Have you ever imagined what it would be like to face your family and friends after being laid off? This is exactly why I wrote "Defy Mediocrity. Choose to be uncommon. Think of the alternative". This book was written specifically to help give you the tools you need to become the best you can in your career and in life. to VP, to President. Many thanks." "This book changed my life. This book really serves as a wakeup call to anyone that works for a living. It focuses you on the fact that you and only you are responsible for your own success. You can’t help but read the book and constantly say “Wow, I can’t believe I used to think that way”. This is truly one of the reference books of my life. I refer to it whenever I’m feeling dissatisfied or unfulfilled at work. I highly recommend it." "Defy Mediocrity is a must read for every professional and for every young person coming out of college into the professional world. It clearly defines what sets the winners apart. I recommend all managers give this book to all incoming staff." "The invaluable advice in your book has changed my life during the last few months and gave me a vision to know how to plan and manage my life and my future. Thank you Derrick you are a mentor in my life." "Your book was written for me. I have read many books in law school and business school. However I have never read a book like yours. I think this book should be mandatory in all business schools. It is a book for everyone that desires to improve their career as well as their life in general. This is a fabulous book! I have read it numerous times and now have heard it on CD for the 3rd time. I needed to read a book like yours and learn to apply it in my life. Thank you for that lesson. I am going to require that all my employees read it." "If you want to significantly increase productivity while dramatically improving morale put a copy of “Defy Mediocrity” in the hands of each of your employees. It will tell them things your managers can't or won't. Do them a favor and do your company a favor and give them a copy of this book! " Frank Bunker ,East Coast Sales Manager, Walker-Clay, Inc.
For more information or for instant downloads please click on the links below. Or if you would like to order a hard copy or the 5 CD audio book version of "Defy Mediocrity. Choose to be Uncommon. Think of the Alternative" please go to the Additional Resources section in the main menu above and place your order today. This is the only site where you can purchase an actual hard copy of this book. For less than the cost of a decent lunch for 2 you can start changing your life today!